Just in the middle of school year so more research papers, homeworks and group projects await you. Good thing that there is Smart Prepaid Jump In with LTE SIM Promo where you and your school buddies can get affordable and exclusive services for all your communication needs. The Jump In sim is a special SIM where you can tap ultrafast internet on your mobile devices and be able to surf for school assignments and keep posted with your social network accounts. For just P15, it comes with FREE 2 days unlimited texts to all networks. You and your circle of friends can enjoy exclusive offers for call, text and data services that will suit your budget and lifestyle as students. Select the best offer that you need without draining your school allowance. Take advantage of this Smart Prepaid Jump In with LTE SIM Promo and its amazing perks designed for your needs. Tell your friends now and gear up for school with this Jump In sim and stay connected whenever you need or wherever you are. Jump In now! Just visit us again to know more about the latest Smart Prepaid promos and Smart’s data offers. You can also check on Smart Communications Facebook Page and Unlipromo Facebook Page for the latest feeds and more exciting offers. gud pm po,paano po mag check balance s smart jump in sim? ?..thank you po..pls reply..
Meron puu bang unli surf ang jumpin ?? guys alam nio po ba yung unli net daw with 2 pesos balance? i can’t access to jump50 it’s only 30 mb for fb? is it updated? 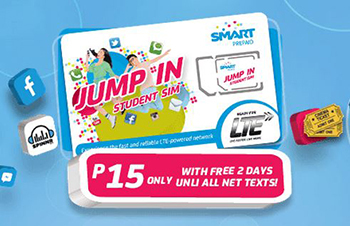 Pwede kayang ipapalit yung smart prepaid sim sa jump in sim card?